Angelika joined to Onix Gloria cattery in 2003. Her first cat was brown classic female Princessa Karasanskij Kiparis. 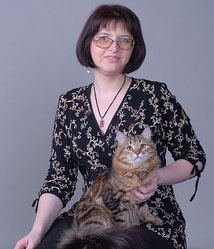 She also is the owner of O`Nezhka Onix Gloria. Angelika often take part in cat shows. Her females won many prestige shows.